Morning friends. I have such a treat for you today - a never-before-seen wedding WOD! Remember the adorable Christmas-CrossFit engagement photos of Alesha and Shane? Well, these two finally tied the knot and wouldn't you know, the two busted out a CrossFit-style workout mid-reception! One of my favorite photographers, Marie Still was there to capture it all on camera and I'm thrilled to get to publish these images here! THIS, my friends is a fit-bride wedding for the books! Way to throw down, Alesha and Shane! What a fun wedding! Marie wasn't sure what the actual workout was (and Alesha wasn't available for comment), but I'm guessing it was an AMRAP of kettlebells + air squats... two signature CrossFit moves! I have no doubt those kettlebells were heavy, too! Maybe 35 and 55 lbs? Though, you'd probably never guess it by the way they're throwing them up! And just look at Alesha getting low in that wedding gown! Way to rock it out, girl! I absolutely LOVE the silver kettle bell! It brings a little sparkle to the sweat fest! And what groom doesn't love ripping off his shirt to reveal a Superman "S"? I bet the crowd went wild when he did - just look at the smiles on all the guest's faces! This looks like so much fun! These two seriously had a blast and that's what a wedding is all about! Not to mention, CrossFit is is so much more than a workout... it's community, it's lifestyle. So, it should come as no surprise when CrossFitters want to make this sport part of their special day. I mean, why not bring the fun of it all to your wedding after party? Marie Still Photography: thank you for sharing these images! And congratulations Alesha & Shane! What an AWESOME way to start the marriage! See Alesha & Shane's engagement photos here. Have you considered doing a workout of the day at your wedding? 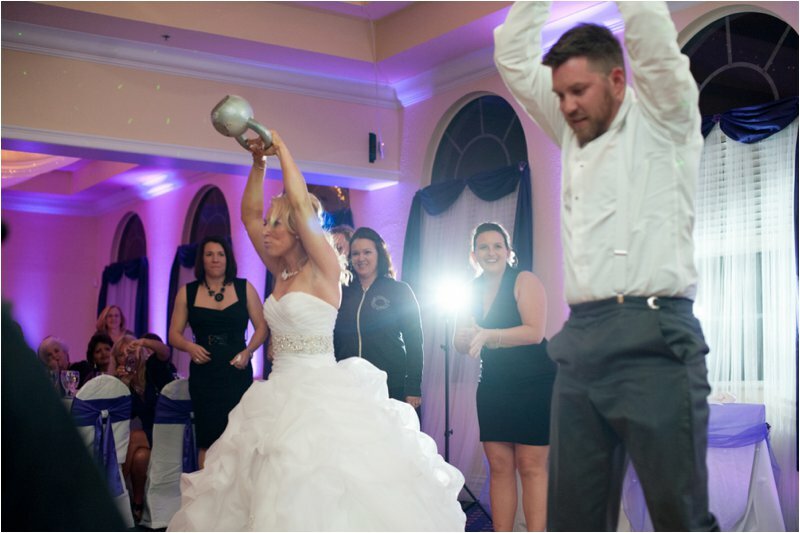 What CrossFit moves would you include in your wedding-day workout?